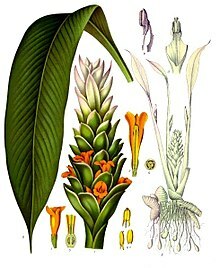 ^ a b c d e f ﻿Herbs at a Glance - Turmeric﻿ (Report). アメリカ国立補完統合衛生センター. (2016-11-30). https://nccih.nih.gov/health/turmeric. ^ “Turmeric--chemistry, technology, and quality”. Crit Rev Food Sci Nutr 12 (3): 199–301. (1980). doi:10.1080/10408398009527278. PMID 6993103. ^ Iwasa M, Kaito M, Ikoma J, Kobayashi Y, Tanaka Y, Higuchi K, Takeuchi K, Iwata K, Watanabe S, Adachi Y. (2002) Dietary iron restriction improves aminotransferase levels in chronic hepatitis C patients. Hepatogastroenterology. 2002 Mar-Apr;49(44):529-31.